There are quite a few venomous creatures here in Arizona, and one of the most impressive is the Arizona Giant Centipede (Scolopendra heros arizonensis). These huge centipedes can grow to over 8 inches (20 cm) long. This unique-looking Arizona subspecies can be identified by its black head and tail, red or orange body, and yellowish legs. 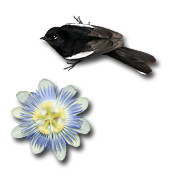 Other subspecies are red-headed or yellowish. This small, young Arizona Giant Centipede below was hiding under some trash cans on my Tucson, Arizona back patio one summer evening. 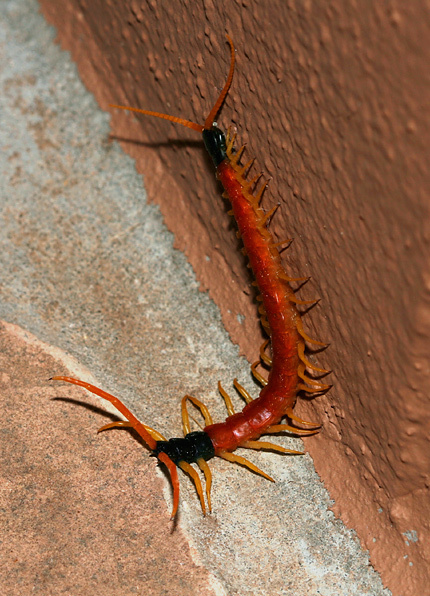 Centipede means "hundred feet", but Arizona Giant Centipedes have significantly fewer. As best as I could count, this one only had around 42 legs (21 pairs) or so. Centipedes have one pair of legs per body segment, unlike the slower-moving Millipedes (Class Diplopoda), which have two pairs of legs per body segment. Arizona Giant Centipedes have a pair of fang-like, venom-filled, modified front legs known as gnathopods. Envenomations or "bites" from Arizona Giant Centipedes are painful, but generally not life-threatening to humans or larger pets, but they can be fatal to small reptiles or rodents. My cats once captured and killed a huge Arizona Giant Centipede in my garage, but thankfully they weren't harmed. I was horrified to see the cats flipping the monstrous centipede around and batting at it, and I hurriedly took it away from them. I tossed the dead centipede over the fence, and it quickly disappeared, so either some bird or animal carried it off or it had just been playing dead (ugh). Arizona Giant Centipedes are nocturnal, hiding in dark, moist areas during the day and emerging on warm, humid nights to hunt for other invertebrates. Here in the Sonoran Desert, they are most often seen during the summer monsoon rainy season when the humidity is higher and bugs are plentiful.